An original and unrivalled floral composition: an ancient inlaid table covered with a table runner in Brussels’ lace bearing the of the symbol of the City, the Archangel St. Michael overwhelming the devil. To celebrate the year 2000 and to do homage to the town of Brussels. 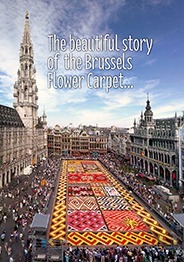 Mr M. Schautteet, successor of Mr E. Stautmans, imagined something really new instead of the traditional Flower Carpet. 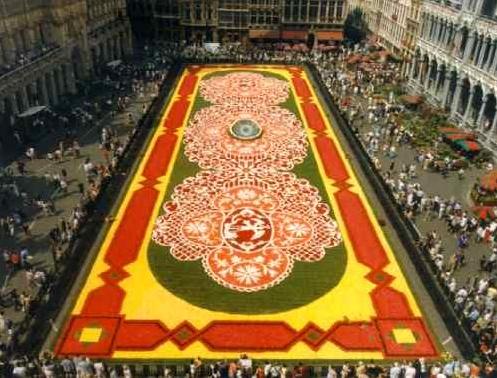 For the first time since the creation of the event, he designed an original and unrivalled floral composition: an ancient inlaid table covered with a table runner in Brussels’ lace ( bearing the symbol of the City: the Archangel St. Michael overwhelming the devil). You can imagine how difficult it was to give back – in still life deception- the texture of wood as well as the delicate intertwining of lace with a material as fragile and alive as begonias.